The 2019 Hyundai Kona offers a spacious interior and plenty of cargo space for your daily travels and longer vacations. Check out the interior dimensions and cargo space below! Front Leg Room 41.5 in. Back Leg Room 34.6 in. Front Shoulder Room 55.5 in. Back Shoulder Room 54.5 in. Front Hip Room 53.3 in. Back Hip Room 52.2 in. As you can see, the 2019 Hyundai Kona is a spacious front row and reasonable back row for you and your passengers. This also brings the Kona to a total interior volume of 113.3 cu. ft. and a total passenger volume to 94.1 cu. ft.
How much space does the 2019 Hyundai Kona have? You’ll have 19.2 cubic feet of cargo space when you have the back seats up. If you fold them down, you’ll have a max cargo space of 45.8 cu. ft. 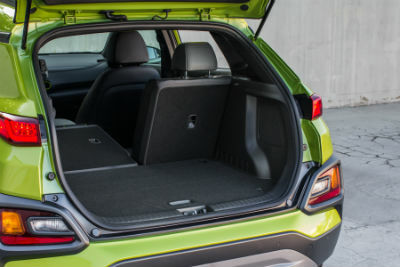 So any dog lovers or camping enthusiasts can rest easy because you’ll have plenty of space in the 2019 Hyundai Kona to haul gear and any four-legged members of your family! Of course, the spacious interior isn’t the only positive aspect of the 2019 Hyundai Kona, so be sure to check out all the other great features it has to offer, including driver-assist features, quirky color options, and much more! You can get the 2019 Hyundai Kona right here at Coastal Hyundai. We are a Hyundai dealership located near Palm Beach, FL, and are ready to help you find your future Hyundai vehicle today! Come on over to find your next vehicle or contact us to schedule a test drive! Either way, our knowledgeable team is ready to help you. How Much Room is Inside the 2019 Hyundai Santa Fe XL? What are the Differences Between the 2019 Hyundai Elantra and Sonata? This entry was posted on Monday, January 28th, 2019 at 1:39 pm	and is filed under Hyundai Kona, Passenger/Cargo Space. You can follow any responses to this entry through the RSS 2.0 feed. You can skip to the end and leave a response. Pinging is currently not allowed.